At Sanford we have a saying: “what we catch today may be on your plate tomorrow night”. It reminds us all that quality is everyone’s responsibility; from the moment the fish is caught, through the processing and shipping, all the way to our customers’ plates. Our quality management system is continually evolving to meet increased demands for product safety and integrity. 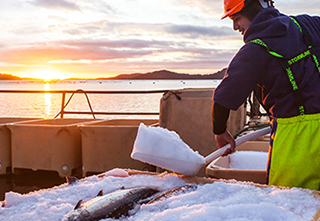 Wherever possible, we integrate our system into our daily production and fishing practices. For example, all members of our fishing and production teams are also quality inspectors and checkers. In addition, each processing site has an independent quality assurance/quality control team and our Group Quality Manager reports directly to the CEO. All of our products are manufactured in accordance with strict policies and specifications outlined in our Risk Management Programme. This helps ensure consistent quality and compliance with the Ministry for Primary Industries (MPI) Seafood Code of Practice. Our processing facilities (vessels and factories) operate food safety systems based on MPI Risk Management Programmes, which utilise Hazard Analysis Critical Control Point (or HACCP) to monitor and control food safety. Our factories and vessels are audited by customers and MPI on a regular basis, to ensure we meet customer quality standards and market access requirements. As more and more customers around the world make purchasing decisions based on the provenance of products, there is an expectation that our seafood’s source and constitution is traceable and identifiable through clear and honest labelling.